There are numerous slang terms and street names for illicit drugs. This drug culture has developed with its own language in which ordinary sounding words can take on entirely different meanings. Slang terms used for drugs can range from humorous to clever to serious warnings. Someone riding the wave or on the nod is under the influence of drugs. To inject drugs with a syringe is to shoot, spike, boot, or slam the drug. Someone who is bipping is snorting drugs, while a tweaker is a person on a mission to find crack cocaine. But, tweek is a methamphetamine-like substance. People who are chiefing, blasting, or participating in a clam bake are smoking marijuana. There are literally hundreds of slang terms or street names for marijuana or cannabis, the most abused drug in the United States. Many terms have been derived from the source of the drug, the effect marijuana has on users or the appearance of the processed plant. But some of the street names are used simply to hide the topic of the conversation. African Bush, African Black, African, Afghani Indica, Acapulco Red, Canadian Black, Chocolate Thai, Columbus Black, Colombian, Hawaiian Homegrown Hay, Hawaiian Black, Indian Hemp, Indian Hay, Jamaican Red Hair, Jamaican Gold, Kentucky Blue, Kona Gold, Manhattan Silver, Mexican Red, Mexican Locoweed, Mexican Green, Mexican Brown, Pakistani Black, Panama Red, Panama Gold, Tex-Mex, and Texas Tea. Some of the terms that are used to describe marijuana are based on the appearance of the processed plant. Not all marijuana appears as a green leafy substance. Some of the slang terms are based on the appearance of the flowers of the plant. Black Gunion, Black Bart, Blue Sage, Blonde, Golden, Greens, Green Goddess, Green Buds, Leaf, Queen Ann's Lace, and Red Bud. Other street terms used for marijuana were originated from how the drug effects users. Different kinds of marijuana can affect users in different ways and these street names reflect those different responses. Some of the terms refer to the potency of the various types of marijuana. Assassin Of Youth, Babysitter, Crying Weed, Crazy Weed, Dinkie Dow, Giggle Weed, Giggle Smoke, Dry High, Joy Smoke, Jolly Green, Killer Weed, Laughing Grass, Laughing Weed, Love Weed, Loco Weed, Magic Smoke, Righteous Bush, Sinsemilla, and Wacky Weed. 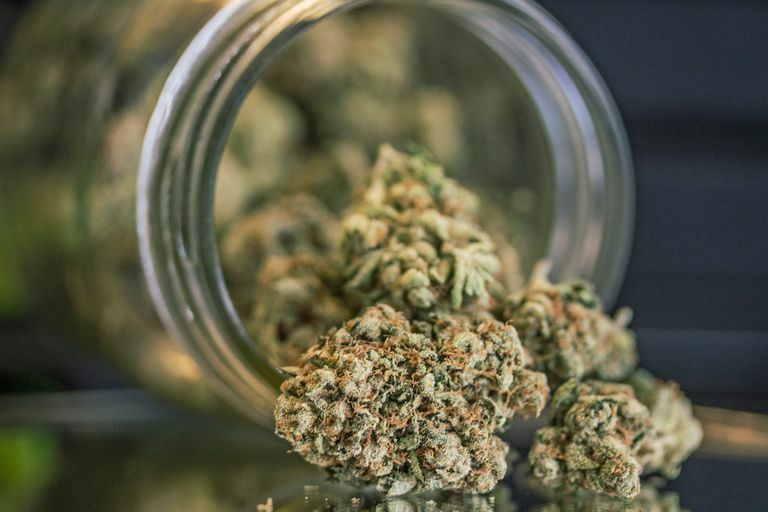 Still other names used to refer to marijuana are based on how the drug is packaged—either at the wholesale bulk level or at the street sales level. Some of these terms are related to how users prepare the drug before smoking it. Some of these terms are alternate names for marijuana cigarettes. Bale, Doobie, Doobee, Doob, Dube, Finger Lid, Grass Brownies, Loaf, and Number. There are many other street terms that are simply alterations of the word "marijuana" itself. And then there are slang terms for marijuana that are based on alternate descriptions of the cannabis plant. These are probably the most well-known names for marijuana. Aunt Mary, Jane, Juanita, M.J., Mary Jonas, Mary Jane, Mary Ann, Mary And Johnny, Mary, Meggie, Megg, Meg, Mary Weaver, Mary Warner, Pot, Reefer, Rope, Tea, and Weed. Finally, there are hundreds of street names for marijuana that seem to be based on no other reason except to cover up the topic of the conversation from possible eavesdroppers. Although some of these may be vaguely based on the appearance or effects of the drug, most seem to have no other purpose except to disguise the topic being discussed. Ashes, Astro Turf, Bash, Bar, Bammy, Bo-Bo, Bo, Broccoli, Colorado Cocktail, Flower Tops, Haircut, Herb, Mootie, Mutha, Muggles, Rainy Day Woman, Skunk, Sticky Icky, Sweet Lucy, and Yellow Submarine. Some of the street names, slang terms, and nicknames given to cocaine during the height of its popularity have become part of the American lexicon. Bernie's Flakes, Big Bloke, Bernie's Gold Dust, Big Flake, Blanca, Crack, Flake, Gold Dust, Haven Dust, Have A Dust, Icing, Line, Pearl, Paradise White, Snow White, Snowcones, Sleigh Ride, White Powder, and White Mosquito. All-American Drug, California Cornflakes, Dream, Double Bubble, Florida Snow, Gift-Of-The-Sun, Foo-Foo Dust, Foo Foo, Girlfriend, Gin, Gift-Of-The-Sun-God, Hunter, King's Habit, King, Love Affair, Late Night, Movie Star Drug, Pimp, Scorpion, Schoolboy, Sevenup, Studio Fuel, Star-Spangled Powder, Stardust, and Society High. Burnese, Inca Message, Peruvian, Perico Cocaine, Percio, Percia, Peruvian Lady, and Peruvian Flake. Big Rush, Bouncing Powder, Friskie Powder, Glad Stuff, Happy Trails, Happy Powder, Happy Dust, Love Affair, Marching Powder, Marching Dust, Ads, Alcoholism, Cocaine, Definition of Alcoholism, Effects of Cocaine, Crack, Nose Powder, Nose Candy, Paradise, and Nose Stuff. Aunt Nora, Angie, Bernie, Bernice, Billie Hoke, Cecil, Carrie Nation, Carrie, Choe, Chippy, Charlie, Corrinne, Corrine, Henry VIII, Her, Jejo, Lady Snow, Merck, Merk, Nieve, Mujer, Schmeck, Serpico 21, and Scottie. Some of cocaine's street names are simply derivatives of the word "cocaine" itself. Or plays on the word "cocaine" or "coke:"
C, Big C, C-Game, Coke, Coconut, Coca, Cola, Lady Caine, and Mama Coca. Base, Basa, Barbs, Bazulco, Beam, Boy, Burese, Carnie, Candy C, Came, C-Dust, Cholly, Combol, Duct, Esnortiar, El Perico, Jelly, Mosquitos, Monster, Teenager, Tardust, Yesco, Yesca, and Zambi. Some of the slang terms for heroin are based on the drug's appearance after it is cut and packaged for sale on the street. Some terms are based on the color of the drug and others on its composition. Black Eagle, Black Tar, Black Pearl, Brown Crystal, Brown Tape, Brown Sugar, Brown Rhine, Dirt, Diesel, Golden Girl, Orange Line, Red Rock, Red Eagle, Red Chicken, Salt, Spider Blue, White Stuff, White Nurse, White Junk, White Stuff, White Nurse, and White Junk. A few of the slang terms are derived from the supposed origin of the drug: Chinese Red, Mexican Mud, and Mexican Horse. Many of the nicknames given to heroin over the years have to do with the effect it has on the user or the quality or pureness of the drug at the street level. Brain Damage, Dead on Arrival, Hard Stuff, Hard Candy, Hairy, Hell Dust, Holy Terror, Joy Flakes, Nice and Easy, Rush Hour, and Sweet Dreams. Some of the most colorful street terms are the names of people or characters loosely associated with the drug or simply because their names start with the letter H. Sometimes, there seems to be no logic at all behind the nickname. Aunt Hazel, Al Capone, Batman, Bart Simpson, Big Harry, Charley, Dooley, Dr. Feelgood, George, Harry, Helen, Hazel, Henry, Hombre, Pluto, Rambo, Scott, The Witch, and The Beast. Some nicknames are based on how heroin is packaged by street level dealers, either by the packaging's appearance or cost: Big Bag, Blue Bag, Blue Star, Brick Gum, and Nickel Deck. Names Based on the Word "Heroin"
Many of the slang terms are plays on the word "heroin" or are mispronunciations of the word. Others are used just because they begin with the letter H.
Big H, Capital H, Galloping Horse, H, Good Horse, Good H, H Caps, Hayron, Hera, Horse, and Hero. Aries, Antifreeze, Ballot, Big Doodig, Bozo, Bonita, Bombs Away, Bull Dog, Foil, Ferry Dust, Little Boy, Noise, Reindeer Dust, Scag, Skag, Smack, and Tootsie Roll. When prescription drugs make their way to the street to be sold for misuse or nonmedical use, they often are given street names to disguise the topic of conversations that might be overheard. The same is true for depressants—barbiturates and benzodiazepines—which are medications prescribed as sedatives or tranquilizers to treat anxiety and insomnia. Like most drugs and medications, nicknames are often derived from the appearance of the drug. In the case of depressants, many street names refer to the color(s) of the pills or capsules. Blue Bullets, Blue Birds, Blue Angels, Blue Tips, Blue Heavens, Blue Dolls, Blue Devil, Green Frog, Green Dragons, Marshmallow Reds, Pink Ladies, Red Bullets, Red and Blue, Rainbows, Reds, and Strawberries. Block Busters, Busters, Downer, Double Trouble, Goofers, Drowsy High, Downie, Idiot Pills, Lay Back, Stumbler, and Stoppers. For depressants, one of the most common sources for nicknames comes from the real names for the medications. Many depressants street names are shortened or alternative versions of their brand names or generic medication names. Barbies, Barb, Bambs, Luds, Ludes, Nimbies, Nemmies, Nebbies, Quad, Phenos, Phennies, Quas, Softballs, Seggy, Seccy, Sopers, Tuie, Tranq, Tooties, and Tooles. Christmas Rolls, Chorals, Dolls, Disco Biscuits, Gangster Pills, and Gorilla Pills. Mickey Finn, King Kong Pills, Mother's Little Helper, Mighty Joe Young, and Mickey's. Backwards, Coral, Joy Juice, Jellies, and Peth. Amp, Bennie, Benz, Black and White, Black Beauties, Black Birds, Black Bombers, Black Mollies, Blacks, Blue Boy, Brain Ticklers, Brownies, Bumblebees, Cartwheels, Chalk, Chicken Powder, Christina, Co-Pilot, Coasts to Coasts, Crisscross, Cross Tops, Crossroads, Dexies, Diet Pills, Dominoes, Double Cross, Fives, Footballs, Forwards, French Blue, Head Drugs, Hearts, Horse Heads, Jam Cecil, Jelly Baby, Jolly Bean, Jugs, Leapers, Lid Proppers, Lightning, Marathons, Minibennie, Nugget, Oranges, Peaches, Pep Pills, Pink Hearts, Pixies, Rhythm, Rippers, Road Dope, Rosa, Roses, Snap, Snow Pallets, Sparkle Plenty, Sparklers, Splash, Splivins, Thrusters, Truck Drivers, Turnabout, Uppers, Uppies, Wake ups, White, Whites, and Zoomers. Beannies, Black Beauty, Blade, Bling Bling, Blue Devils, Blue Meth, Chicken Feed, Cinnamon, Clear, Cr, Crink, Cris, Cristina, Crossles, Crypto, Crystal Meth, Desocsins, Desogtion, Fast, Geep, Geeter, Getgo, Granulated Orange, Kaksonjae, L.A. Glass, L.A. Ice, Load Of Laundry, Meth, Methlies Quik, Motorcycle Crack, Nazimeth, Pink, Pink Elephants, Po Coke, Poor Man's Coke, Redneck Cocaine, Rock, Schmiz, Scootie, Sketch, Spackle, Speckled Birds, Spoosh, Tick Tick, Trash, Wash, Work, Working Man's Cocaine, Yaba, Yellow Bam, and Yellow Powder. Adam, Baby Slits, Beans, Booty Juice, Candy, Chocolate Chips, Clarity, Dancing Shoes, Decadence, Disco Biscuits, Doctor, Doves, E-Bomb, E, Egg Rolls, Essence, Happy Pill, Hug Drug, Kleenex, Love doctor, Love drug, Love potion No. 9, Love trip, Malcolm, Malcolm X, Molly, Scooby Snacks, Skittles, Slits, Smartees, Speed for lovers, Sweets, Thizz, Vitamin E, Vitamin X, Vowels, and XTC.